Micheál Martin phoned Enda Kenny before lunchtime today – but what was said is the subject of some dispute. MICHEÁL MARTIN AND ENDA Kenny have spoken by phone for the first time since the general election – but there is some confusion over what was said during the call. Martin has said that the pair have agreed to meet for talks on government formation next week, but Fine Gael have claimed there was no agreement and that Kenny later offered, by text, to meet as early as tomorrow. Earlier, the Fianna Fáil leader said he rang his Fine Gael counterpart before lunch and that they agreed to continue their respective discussions with independent TDs ahead of the Dáil vote to elect a Taoiseach next Wednesday. We, on the phone, agreed that we would engage in the aftermath of that and following the conclusion of those discussions and the vote itself on Wednesday. However, Fine Gael sources have said that there was no agreement to meet following the Dáil vote next week and that Martin never asked to meet Kenny in the discussion. A well-placed source said that Kenny subsequently tried to phone Martin back to arrange a meeting as early as tomorrow, but there was no answer. The source said that Kenny then sent a text to Martin offering to meet tomorrow afternoon following the conclusion of Fine Gael’s talks with independents. However, Fianna Fáil sources said that Martin did not see this text until after he spoke to the media on the Leinster House plinth this afternoon. A well-placed Fianna Fáil source has now disputed Fine Gael’s account of Martin’s conversation with Kenny and insisted that the pair did agree to talk after Wednesday. The source said that Martin only saw Kenny’s text after his press conference and responded to Kenny to the effect that they should meet, as agreed, after next Wednesday in order to allow Fine Gael and Fianna Fáil time to continue its discussions with independents. Asked by the media if Kenny offered to meet tomorrow, Martin said the Taoiseach “may be texting or whatever like that” but added: ”We agreed that we wouldn’t meet tomorrow, because he [Kenny] said he was finishing his discussions tomorrow. He said he was going to polish off, to use his phrase, the [Fine Gael] document [with independent TDs]. Addressing the media, Martin made clear that he wished to continue discussions with independent deputies in the coming days. He is due to meet with independents Clare Daly and Mick Wallace later and hold roundtable talks with as many as 15 other independent TDs next Monday and Tuesday prior to the Dáil vote the following day. Martin said he rang Kenny to establish the truth of reports that next Wednesday’s vote for Taoiseach would be deferred due to the ongoing failure to form a government. He said he got an assurance from the Taoiseach that the vote would go ahead as planned. Martin also said that he relayed his frustration to Kenny over comments made by Richard Bruton yesterday in which he ruled out Fine Gael supporting a minority Fianna Fáil government. The Cork South-Central TD said he would continue efforts to form a minority government led by his party, but did not rule out supporting a Fine Gael minority government. “I know that people are anxious to know when a government is formed, but I think we’re still some few weeks away from that yet,” he added. He said that Fianna Fáil’s policy on abolishing Irish Water and suspending water charges remained and it would not be pulling back from it. But he encouraged people to continue to pay their bills. 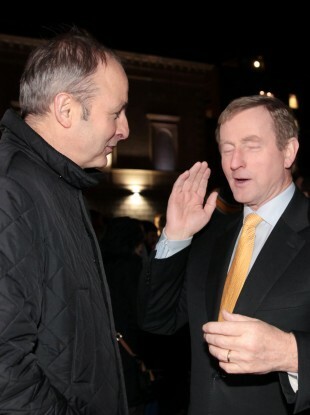 Email “Enda and Micheál finally speak on the phone - but there's confusion over who said what ”. Feedback on “Enda and Micheál finally speak on the phone - but there's confusion over who said what ”.